Moreover, the government intends to help make Nova Scotia a more accessible and inclusive place to live and work. Bill No. 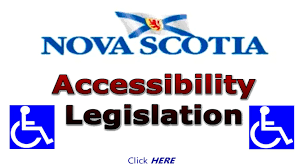 59, An Act Respecting Accessibility in Nova Scotia gives the government the ability to oversee the development and implementation of accessibility standards necessary to attain the purpose of the new Accessibility Act. The proposed Nova Scotia accessibility legislation decides broadly on what must be included in the standards, what organization it can apply to and who must be consulted on the standards, among other things. Accompanying regulations will be more specific on requirements in each standard and who it applies to. It also decides the timeline for consultation on a standard and approval process. The Bill however, does specify that every public sector body must prepare and make publicly available an accessibility plan to report on measures the public sector body has taken and intends to take to identify, reduce, remove and prevent barriers. The Bill also allows the government to create an Accessibility Directorate to support the implementation, administration and enforcement of the Accessibility Act and the regulations, including standards. An Accessibility Advisory Board consisting of 12 members must also be created to consult and advise on the standards to be implemented. The Bill also provides a framework for compliance and enforcement of the accessibility law and its standards. Details will be found in Regulations. There will be provisions respecting record-keeping and reporting requirements for individuals and organizations that are subject to an accessibility standard. If the Bill is enacted, it will come into force on proclamation at a later date than royal assent. The Bill is similar with existing Accessibility legislation found in Ontario and Manitoba. Re: “The Bill is similar with existing Accessibility legislation found in Ontario and Manitoba”. Hopefully the similarity ends in the area of hearing accessibility. The Ontario version is weak in supporting the needs of those who live with hearing loss. Accessibility is only complete when it includes sensory issues such as hearing loss. The technology exists.